On a warm Friday in September, Dean Lee took Chancellor Davenport on a three-hour tour of the College of Arts and Sciences. They met professors, walked through a tropical greenhouse, and braved the heat of the day along the way. Their trip ended not on an uncharted desert isle, but in the cool refuge of Ayres Hall on the Mighty Hill. The three-hour tour gave her a taste of the offerings in the College of Arts and Sciences. The tour began at the Clarence Brown Theatre where Chancellor Davenport met faculty and students in the Department of Theatre. Director Cal MacLean shared the history of the department and some of the challenges they face – mainly the lack of a unified home for the department. In the Carousel Theatre, Davenport spent a few minutes talking with students and learning about their experiences. She joined them on the stage for a few photos before leaving the cool, quite of the Carousel for the bright, busy floors of McClung Tower. English professors, including Margaret Lazarus Dean and Department Head Allen Dunn, met Davenport and Lee outside the Writing Center. 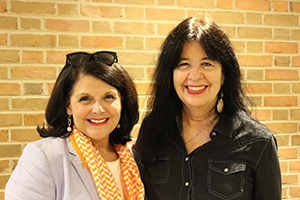 A chance encounter with Joy Harjo occurred, and afterwards, Davenport walked through the threshold of the Writing Center to meet students and learn more about how the Center helps them succeed. Lee, ever cautious of the time restraints, ushered Davenport to the infamous McClung elevator to continue the tour in the heart of the humanities. 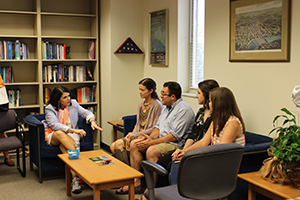 When the doors opened, Davenport and Lee stepped into the international world of the Department of Modern Foreign Languages and Literatures. Department Head Adrian Del Caro, students, and lecturers led Davenport around the floor as they shared the breadth and depth of the department. The group came to a stop in a small room where students and lecturers meet. With two sessions in progress, the room looked sufficient; but Davenport soon learned that despite the view, the room was simply too small to accommodate the eight lecturers that called the space their office. Davenport began to see the theme of the tour – space. Not the space planetary scientists explore, but the space needed to provide the foundational skills each student at the University of Tennessee receives from the College of Arts and Sciences. Sociology was the next stop on the tour. Davenport visited with several professors and learned, to her surprise, UT does not have a social science research center. She praised the work of social justice warriors and learned that faculty in the department considered sociology one of the most engaged departments on campus. As the duo left the Tower, Jon Shefner, department head and consummate rabble-rouser, reminded Davenport of the important issue at-hand – outsourcing. She smiled and nodded her head as Lee led her through the plaza to their next stop – the School of Art. David Wilson, director, and several students met Lee and Davenport at the Ewing Gallery, but did not have much time to talk before Davenport stepped into the gallery to admire the installations. Art on walls, on the floor, art in a room within a room – the gallery showcased several unique pieces. Davenport asked when the walls in her office would be covered with this art, but never quite got an answer. She did, however, understand the importance of the gallery as a graduate recruiting tool. Lee tried to pull Davenport away from the awe of the Ewing several times, and finally succeeded on the fourth attempt. Running a few minutes behind, the duo briskly walked through the Humanities Plaza, across the Pedestrian Bridge, and into the Burchfiel Geography Building. Ron Kalafsky, geography department head, students, and a few other faculty were already waiting for their opportunity to meet the Chancellor. Relieved to sit a few moments, Davenport engaged the students in a conversation about the variety of programs within the department. She also learned the sad fact that in Tennessee, most students did not know geography was a job option. Outreach and education is key to this problem and a point the group made loud and clear during the discussion. After a quick walk through the hall to view the ancient maps, Lee and Davenport began their journey up the Hill – a right-of-passage and a walk Davenport had yet to make since joining the Volunteer family. Lee’s home department of psychology concluded the social sciences portion of the tour. In Austin Peay, Davenport visited a cognitive research lab and discussed the issues of opioid use in Tennessee with Deb Welsh, department head, but a tropical paradise awaited Lee and Davenport. 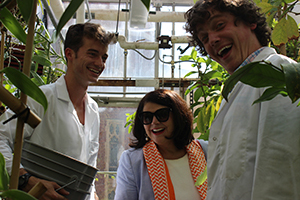 Susan Kalisz, department head of ecology and evolutionary biology, greeted Lee and Davenport at Hesler to show off the recently renovated greenhouses. Like the Ewing Gallery, the greenhouses captured Davenport’s attention as she walked through the living showcase of tropical plants and flowers. Students shared their experience working and researching in the greenhouses, but time was running out. Lee had less than an hour to finish the tour and still had two departments on her list. At Buehler Hall, Chuck Feigerle, department head, and Shawn Campagna showed Davenport a chemistry lab, which looked much different from the ones in Strong Hall. A graduate student in the lab briefly talked with Davenport about his research and experience as a chemistry major until it was time to leave. With one more stop and 20 minutes left on the clock, Lee ushered Davenport out of Buehler for the final push up the Hill to the entrance of Ayres Hall. On the second floor, Conrad Plaut, head of the Department of Mathematics, two faculty, and a few students waited to share the success of Math Camp. Davenport was impressed by the impact the program had on student success and asked why it was not part of every university’s curriculum. Lee smiled and responded that she hoped it would be soon. Finally, at 3:59 p.m., Davenport and Lee entered the Dean’s Suite, taking the final step of their three-hour tour. Associate deans in the college, who thought it might be impossible to finish the tour in three hours, applauded Dean Lee’s accomplishment and greeted the Chancellor with warm smiles and cookies. Davenport stayed for one final photo before moving on to her next appointment. Although her three-hour tour of the College of Arts and Sciences was over, Chancellor Davenport began a new journey to share the importance of the college as the gateway of knowledge for the University of Tennessee.